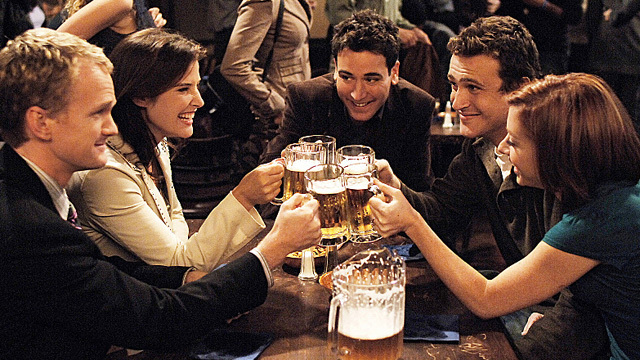 Watching the terrible, awful series finale of How I Met Your Mother was a trying experience. I had hoped beyond hope that the writers wouldn’t do what they did, that the show would be better than it was. All of my hopes were dashed. Honestly, there’s no way it could have been worse. And after watching the finale, I couldn’t help but realize I was grieving, grieving for a show I once would have called my favorite, that has been with me for so long. In fact, I kind of went through the five stages of grief in the past 24 hours. They’re not going to do this, right? I’ve already said how they can’t do this. HIMYM is a fairy tale. The Mother is the happy ending, not Robin. They wouldn’t do this. They can’t do this. They can’t betray nine years of character development. We’ve heard over and over again why Ted and Robin don’t belong together. She had her chance, and she doesn’t deserve another. Not that Ted is some big catch or anything, but she could have said yes a bunch of times. Like, she could have said it when they broke up in season 2. She could have said it when Ted declared his love for her in season 7. She could have said it before she went to meet Barney on that rooftop. She could have not let Ted talk her into going through with marrying Barney. So they’re not going to somehow make it so that she wants Ted again and she gets him? They’re not going to do this to the Mother, right? They’re not going to just make her be one in the long line of Ted’s love interests on his way to finally winning Robin. It’s not like her first kid with Ted was an accident so she’s just ends up being the love interest who finally stuck around. She’s not just here to be like, a functioning uterus so Ted can both have his perfect wife and kids and then get Robin too. They’re not going to kill her with a random disease with such casual blase and then have the very next sequence be a teenager convincing her father to bang her Aunt. They’re not going to turn back the clock on Barney’s character development, right? They’re not going to have him and Robin divorce for like no good reason 3 years in and then estrange Robin from the group and make Barney this sad sack of a man. They’re not going to introduce a random baby and baby-mama for him to make him good again like some rom-com cliche. They’re not going to forget that Barney isn’t the Barney who wanted to bang Lebanese chics in the pilot. They’re not going to have this weird theme where women’s careers are the source of all marital problems and unhappiness for men. Because that would be a bridge too far for a show that has too often relied on heteronormative tropes for humor. It’s not like the only reason Lily gets to go to Rome for her career is because she’s giving Marshall another baby, and then he is miserable for years because that choice ruined his career. Barney and Robin won’t end their marriage because Robin is pursuing a successful career as a journalist. They just can’t. It’s not like HIMYM would do this to me, after I have been watching for all these years, right? YOU HAVE GOT TO BE KIDDING ME. TED AND ROBIN ARE BACK AFTER THEY UNCEREMONIOUSLY KILLED OFF THE MOTHER I’M NEVER FORGIVING THIS SHOW EVER, EVER AGAIN. I HATE EVERYTHING AND EVERYONE. Please change it. I’ll do anything. I’ll watch NCIS. Give me a DVD extra. Tell me it was all a dream. Tell me they were in purgatory. Arrest everyone. Nine seasons and a movie! Show me a place where the Mother is still alive and Barney and Robin are still married and there aren’t implication that the only thing women are good for is their ability to bear children, and that women’s career won’t end marriages, and having babies won’t magically redeem characters. Please show me that place. I will give anything. Guys like, why did we ever even watch this show? It’s the worst. Remember Zoey? She was the worst. And that stupid smoking episode from season 5. God I hated that episode. It was never good after season 4. Why did we kid ourselves and keep watching it for five more years? Of course they killed the Mother. They’ve been foreshadowing it since “The Time Travelers.” You know I thought the writers were better than this. I thought they wouldn’t turn around and ruin the entire concept on which their show was built. I should never expect good things from people. I thought the constant Ted and Robin harping was a red herring. I should have never fooled myself. I thought the Mother was the best thing to happen to the show in years. Of course they killed her. I thought Barney and Robin were better as a couple than Ted and Robin. Of course they divorced. I thought this show had one last chance to get it right. Of course it got it wrong. Okay fine. It happened. I can’t do anything about it. But let me just say this: I’m probably not watching How I Met Your Dad.